PHOTO BY WILL BRYANT. 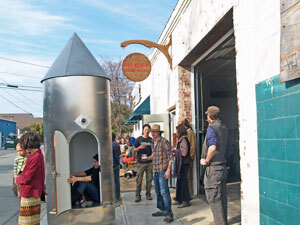 Artist and inventor Josh Lev watches as visitors enjoy his latest innovation, ‘new Whirld,’ at an exhibit in Carrboro on Sunday. Artists have always aimed to expand people’s creative horizons and challenge a culture’s standards and perspectives. Local artists Josh Lev and Leo Gaev have done just that and more with their latest piece of interactive art, titled “new Whirld.” At the piece’s official display at Leo Gaev Metalworks in Carrboro on Sunday, the two showed how they’ve put a spin on art, flipping it completely upside down. Standing more than 12 feet tall and weighing nearly 500 pounds, new Whirld is the Earth’s first spinning camera obscura. Constructed by Gaev, new Whirld looks and feels like a spaceship but actually features an ancient technology under a new-age disguise. Built with an aluminum frame and a stainless-steel exterior, Gaev said new Whirld was a one-of-a-kind project. Discovered around 400 B.C., the camera obscura technology is photography’s distant relative and found use by ancient Greek and Chinese cultures and later by Renaissance painters. New Whirld consists of a dark room that’s entered by a shiny copper hatch. Set in the hatch is a lens that allows light from the outside to pass through and strike the interior wall. The result is that the outside image is reproduced inside the room, upside-down and flipped, but with color and perspective intact. New Whirld also has a steering wheel inside, which allows users to turn themselves 360 degrees inside the machine. Lev said his purpose for the piece was to challenge people’s sensory perception. This isn’t the first time one of Lev’s pieces of art has been on display in the Carrboro area. Some might remember his original camera obscura that stood at 400 W. Main St. in Carrboro, directly across from the fire station. The piece, which served as Lev’s senior thesis for Amherst College in Massachusetts, was a Carrboro landmark that stood for nearly 15 years. “A lot of people knew me from that piece,” Lev said. “Mayor Nelson asked at the time if it was an outhouse,” he said with a smile. Lev says he would love to find a home for new Whirld somewhere in Carrboro, but says he would prefer that it find its way into a museum, where it could continue to inspire people. Lev hopes that if people notice how beautiful the world is through his lens, maybe the world could become a more beautiful place. “That’s something art can do,” he said.